Summer is the busiest time for the packers and companies in India, for most of the transfer and posting happen between April and August. If you have got promotion, then probably that’s the best experience to have, but if you are being transferred to a different city or state, I am sure you will be concerned about relocating your household goods and family. And lets agree on that, shifting and relocating to a distant city is not going to be easy, even if you there are professional movers and packers agencies available across all cities in India, who can help you. As the number of people relocating is increasing rapidly these days. The number of cases of fraud and cheating by movers and packers has also increased to an alarming level. And if you are planning to avail the services of packers and movers for household relocation and you are concerned about the frauds and cheating by the movers and packers, then worry not. Today I am going to help you about how to spot and avoid frauds by packers and movers in India. I have personal experience of working with a number of movers and packers companies in India. I have also used their services many times in the past. And based on my personal experience in working with packers and movers companies, I can tell you that it’s not that difficult to avoid relocation frauds and cheating by movers and packers companies in India. Having said that, let me tell you that you should not start doubting every other relocation company in India, because the number of fraudster relocation companies are just a few, who bring the band name to the entire industry. But if you are a little cautious and practical, you should be able to spot and avoid frauds and cheating by packers and movers easily. Home shifting is a common thing nowadays with several families shifting from one place to another, yearly or in every three years due to job transfer. Be it local shifting within same city or interstate household relocation, the number of people relocating every month is increasing rapidly. While some shift due to higher studies, some due to better job opportunities, other may have to relocate due to job transfer, they all need movers and packers services to relocate without hassles. This increasing trend of home shifting has led to the demand of the rise in the packers and movers services. Home shifting is quite a hectic thing and so most people prefer to take the help of the professional movers to relocate swiftly and on time. Although using movers and packers services for relocation can be of great help, sometimes we fall at the hands of the fraud packers and movers who fool us for their personal gain. So, while choosing the movers and packers companies, you must be very careful. And to help you up I have listed 13 tricks on how to spot and avoid frauds by packers and movers in India. With the establishment of various packers and movers in almost all parts of India, home shifting today has become an easy task. We simply have to book them and let our basic requirements known to them and they will execute the whole shifting process without issues. However, choosing the right movers and packers agency is seriously important because the safety and timely delivery of goods lies entirely on them. In fact, since the cases of forgery have also increased, you must be a little cautious while evaluating and hiring the movers and packers. As they say, prevention is always better than cure, if you once fall in the wrong hands; you may end-up at a huge loss. Trust me; choosing the right packers and movers for yourself is not a very big headache provided you follow some simple tactics. Most of the fraud companies have certain things in common and if you are aware of those things, you will be able to spot and avoid them easily. 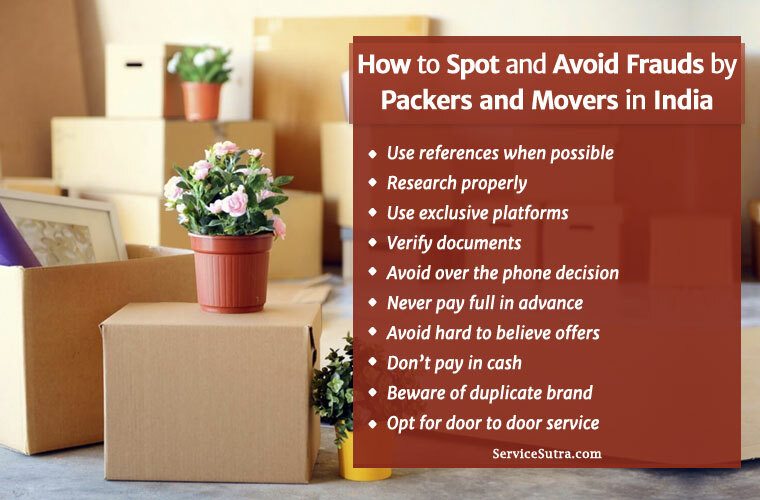 My 13 easiest tips on how to spot and avoid frauds by the packers and movers will definitely help you throughout the process. You just have to be smart, confident and a little wise while screening the movers and packers for relocation. I think most of you are eager to know the ways on how to spot and avoid frauds by the packers and movers companies. So, without wasting any time, let’s get to the point. Finding the packers and movers who genuinely are the best in the trade can make all the difference. The number of fraud and cases of cheating are increasing day by day in packers and movers industry. Many companies illegally forge the money of the customers and sometimes even harass them with their goods. But, if you follow a few basic tactics, then you will be able to avoid such fraud and cheating situations easily. Since online reviews are often found to be fake or made-up, you may choose the companies by taking references from trusted sources. Like for example, if any of your trusted friends, neighbours, relatives etc. has relocated, then they may be able to refer you to the packers and movers they used. If they were satisfied with the services of a specific packers and movers, then you can use that as reference and connect with the said service provider. When a friend is referring you to the movers and packers, at least you can be a little sure about the reliability of the service provider. But don’t go on face value because just because your friend has referred does not mean they will get it right this time as well. So keep them in the pipeline and continue your investigation before finalizing. You got to work out the rates and delivery time as well, because that’s equally important. As I said, it’s best to hire movers and packers based on recommendation from friend and family, but what if there is none? Well in that case, you have to take charge and start researching for a couple of leading packers and movers. With adequate research and screening steps, you can easily spot and avoid fraud and scams by movers and packers. You must cross check and see whether the packer and mover you plan to hire is reliable or not. Go through the profile thoroughly and check reviews and feedback to get a fair idea. Even online reviews are found to be fake so read it carefully. The best you can do is to consider 3 or 4 relocation companies instead of banking on one. The more the options you keep for yourself, the less vulnerable you will be to forgery as it is very rare that all of your options will turn fraud. Once you have shortlisted the top three or four agencies, you will be able to compare and write off a few of them and continue evaluating the rest. The next alternative option and probably the wisest one is to use a platform to get connected with the pre-screened and verified packers and movers from all over the country. Generally, there are many dedicated platforms that connect users with pre-verified packers and movers companies. Advantage of using such platform is that they just connect you to two or three companies that they have verified. They just connect you to them, hiring is ultimately your own decision, so you kind of get the liberty to evaluate and screen the agencies on your own parameters and then choose the agency you think suits you better. Apart from being document verified, these movers and packers tend to behave properly because if they are found to be involved in any case of irresponsibility, the platform may remove them and they will not get business through the platform. As we have our platform, we can confidently say that the movers and packers on board are all document verified. Proper verification is done before the companies are on boarded on our platform. So, you can rest assure that the relocation companies you get matched with are all licensed and are trustworthy with accidents being the only exception. Here you are generally connected to three different companies and you after talking to each one of them have to take the decision of whom to choose. Since, all the companies are good, there is no chance of taking a major wrong decision. And, what is more interesting is that ServiceSutra does not even charge a penny from you. You only have to pay the packer and mover for the services at costs you both agree on independently. Get started by submitting this free quote request form now! It is mandatory for you to choose a licensed packer and mover irrespective of the source you prefer to get connected to them. This is because there are so many companies and not all are trustworthy. But if the companyis licensed, you will be able to complain or track the existence quickly in case of any problem. So before hiring the packers and movers, please check the legal documents, given by the state or central government like a Good and Service tax registration, Pan Card in the name of the firm, shop and establishment licence etc. Also, take time to study the terms and conditions regarding the home shifting process. Cross check properly about the company and then take the decision to hire. It is important that you do not take decisions over the phone. This is because if you finalize over the phone, you will not be able to meet them in person beforehand which is actually a very important thing. You must talk to them face to face and then observe them properly and then take the decision. If you take the help of ServiceSutra, then you generally be connected with companies who give you the option of pre-surveying your home. It is a very good step that the packers and movers team come to your home, survey all the belongings and then give the proper accurate ratings. This is much more genuine and also helps you avoid financial problems later as well as help you lessen the chances of fraud. One of the important tips on how to spot and avoid fraud done by the packers and movers is by not paying them from beforehand. Most of the fraud ones aim in talking a good amount as advance and they try in every possible way to convince you. So, if you find any company members trying to force you a lot, then that is something you must take note of. I personally prefer to pay the charges once the belongings are delivered safely at the destination, but usually the 60-40 or 50-50 is the norm, which means 50 to 60% at the time of loading and remaining on delivery. The payment terms are usually flexible and you can negotiate for a favourable payment term. But the most of the movers will ask for 70 to 80% as advance, remaining at the delivery. Whatever payment term you negotiate, the advance should be paid only after the packing is done, not at the time of survey or earlier. I have heard of cases, where the movers took some advance and never turned up for packing, so discuss this with the agency you plan to hire. See, the trick that most fraud packers and movers play to fool the customers is by putting up very attractive offers. They charge at real cheap rates so that most get carried away with that and hire them. So, another important tip on how to spot and avoid fraud done by the packers and movers is by not going for too low prices. You see, most of the good companies provide excellent services and they charge as per market prices and they are completely worth it. So please do not be greedy and go for the packers and movers offering hard to believe rates because there may be hidden charges as you move on. There have been cases, where movers and packers have demanded more money while the goods are in transit. Be very careful not to pay the movers and packers in cash. Always opt for cheque or digital payment and that too in the name of the company. This is one of the essential steps on how to spot and avoid fraud packers and movers. Any transactions done in cash have no solid evidence and so you must never do it. Many packers and movers who are not up to date, prefer doing the money dealings in cash, so if any company pressurizes or tries to persuade you too pay in cash transactions, then you must avoid such agencies. Also, if a packers and movers company is accepting payment through cheque that means there is a valid and active bank account and you know bank checks all the documents before opening an account. Another weapon the fraud companies use to attract customers is by putting up very eye-catching websites. Most customers will get fooled thinking them to be really reputed companies with good offers and the moment you fall in their trap, they will betray you. So be very careful while going through the company profiles and websites. A systemic and nicely arranged website is definitely a good thing but when you see something extra, that is something which must strike you. In fact, sometimes they have more than one websites and come up with names similar to any already branded and reputed company, so that innocent people get confused and hire them. So, try to be very careful with it. Besides using similar names of already reputed brands, many fraud companies also promise that they are under any reputed brand or are a part of some top-level service providers. This is one of the many techniques they use to catch potential customers. In fact, this not just traps the innocent people but also malign the name and the goodwill of the trusted brand that they refer to. So, kindly be aware of this. To avoid it, you may call up the actual brand and do cross check instead of blindly trusting the fraud companies. This is another good step to spot and avoid frauds by the packers and movers agencies in India. Most of the trusted and licensed packers and movers offer door to door shifting services. But sometime, movers may just skip mentioning this and then what happens is irritating. The movers and packers will unload your goods on the highway and ask you to arrange for local transportation or they may ask for absurd amounts to deliver your goods to your home. It’s always better to discuss the delivery bit well in advance before finalizing the mover and packers. One of the best ways on how to spot and avoid frauds by packers and movers is to know about your own rights. Before moving take a copy of the rights and responsibilities from the service providers whom you have hired. If anything goes wrong, you can go for insurance claim, and hence you should know about the process of claiming insurance and amount that you are insured for. Many companies store up the consignments until they get another order to full up their delivery van else they sometimes ask for the extra expenses. This is one trick which many such companies do and you must not fall prey to that. Do not pay extra for warehousing services. No company can charge you extra without your approval. You must make sure that your goods get delivered in your committed date irrespective of their delivery van being full or empty and when you discuss about these finer details well in advance, it will certainly help you avoid any hassles moving forward. Home shifting is an important aspect of life which many of us experience and to make the experience swift and easy, we take the help of the packers and movers. Most service providers are very good and they are very dedicated and focused in their work. They charge reasonably and provide end to end shifting service. Many of them also provide you with insurance offers for your goods in order to help you incur accidental losses. While on one hand, there is the dedicated lot of service providers, on the other hand, there are companies who aim to forge people and cheat innocent souls with their money. So, since both good and fraud companies exist parallelly, it is your responsibility to be very careful while choosing the packers and movers. Now you may get worried regarding what to do and how to choose butlet me tell you that if you are smart and knowledgeable enough you will never let the fraud companies fool you. In fact, I have noted down 13 important tips on how to spot and avoid fraud done by the packers and movers and I believe that if you follow these, the chances of forgery will get minimalized. Most of the fraud companies look for innocent stupid individuals and so do not let them fool you so easily. Are you shifting anytime soon? Are you worried about the fraud packers and movers all around? Well my 13 important tricks on how to spot and avoid fraud done by the packers and movers will help you up then. Follow these easy hacks while choosing the packers and movers and enjoy a hassle-free home shifting experience.